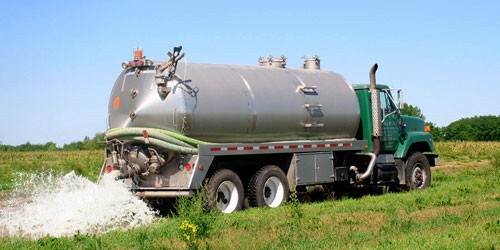 ULWR utilizes a variety of methods for land application of wastewater bio-solids. The primary system is draghose injection; this employs trucks to haul from a storage facility to a field site. At a given field site the truck attaches to a diesel engine pump that sends the liquid out to an injector unit attached to a tractor thru a hose that can be up to three miles long. This method is very environmentally friendly in that it reduces compaction in a field as well as directly injecting the liquid below the soil surface. 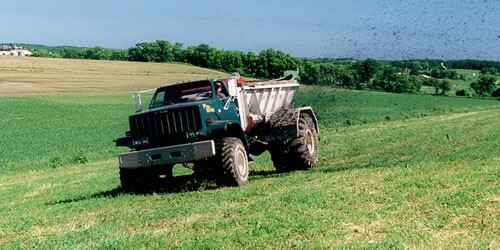 ULWR has 5-complete injector systems, 7-diesel engine pumps, 5-lagoon mixing pumps, 9-4x4 John Deere tractors, and 5 miles of hose giving them one of the regions largest selections of equipment to meet the needs of most any type and size of project, from livestock manures to municipal and industrial wastewater. ULW also has five 4,500 gallon Peterbuilt tanker trucks which are equipped with spray guns or splash pans as well as two 4,800 gallon manure tankers which can be equipped with injectors if needed. All of ULW's equipment is operated by a staff with many years of experience who take great pride in meeting the customers needs and protecting the environment at the same time.